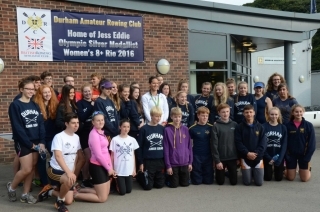 Olympic silver medallist Jess Eddie called in at Durham Amateur Rowing Club on Saturday to show the medal she won in Rio to members of the club where she started her rowing career. 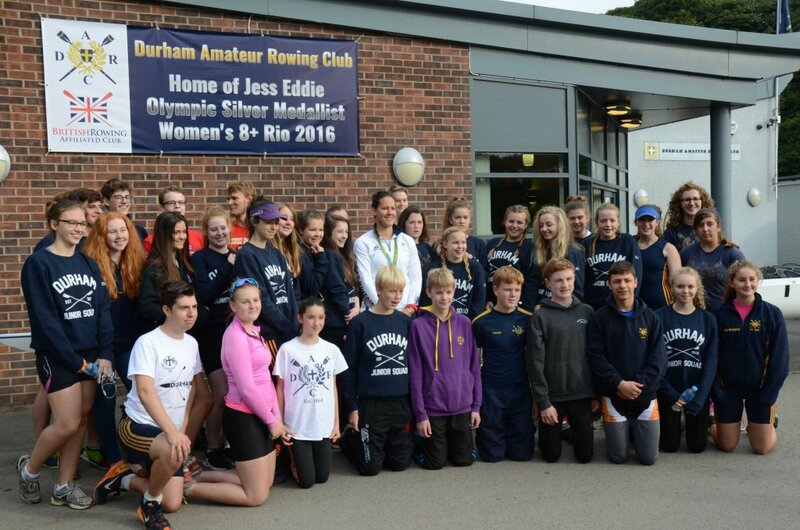 Now based in London Jess had spent the last week touring the north-east with fellow Great Britain rowing squad member Nathaniel Reilly-O’Donnell, visiting schools and clubs and inspiring the next generation of athletes. Jess was a member of the GB Women’s Eight who took silver in Rio on the final day of the rowing competition at Lagoa Rodrigo de Freitas, taking part in her third Olympic Games. Now 31 she went to St Leonard’s School in Durham and took up rowing at the age of eight, achieving success with Durham ARC Juniors and representing Great Britain in the World Junior Championships in 2001 while a member of the Club’s Juniors squad. In 2013 Durham ARC named a lightweight Eight ‘Jessica Eddie’ in her honour, which she officially launched in October of that year. A banner was unveiled to mark the occasion of Saturday’s visit. After a welcome from Durham ARC President Ian Shepherd Jess addressed the assembled members and spent an hour or so chatting to the current Juniors squad. This was followed by scratch 8s races for seniors and quads for juniors. Three eights and 4 quads enjoyed some friendly competition before retiring to the clubhouse for a BBQ lunch. This entry was posted in Club News on September 28, 2016 by Colin Lawson. September sunshine welcomed the 9 crews entered for the 2016 Allcomers Regatta, six mixed (including one all-female) and 3 men’s fours. After a few short weeks of intensive training friendly hostilities commenced over a 300 metre course with round-robin races alternating between DARC’s two stable boats and the pair borrowed from Durham University Boat Club. The mixed competition was won by Boaty McBoatface (coached and coxed by Stephen Auster) winning all 4 of their races, with Daream Team (coxed by Nicola Field) in second place with 3 wins. With a three-way tie on 2 wins each in the men’s competition the outcome was determined by a one-minute ergo relay. Five coxes in a boat (coached by Elliot Kay and coxed by Shannon Kay) took the honours with Blazing Paddles from Workwear Express taking second place. An inter race interval allowed time for an octuple demonstration, the most recent addition to the club’s fleet, while spectators assembled on the riverbank enjoyed Pimms and ice cream. Special thanks go to Rebecca French for undertaking the bulk of the organisation. This entry was posted in Event News on September 21, 2016 by Colin Lawson. Ten DARC members took part in the World Rowing Masters Championships between September 8th and 11th, this year taking place at Lake Bagsvaerd near Copenhagen in Denmark. The Championships is a huge event, and welcomed 3451 rowers from 584 different clubs and from more than 40 countries. Masters rowers compete over a 1000 metre course with over 500 heats during the 4 days of competition. Races are organised into age categories from age 27 (Masters A) upwards, Masters E being for average ages 55-59, F for ages 60-64, G for 65-69 and K being for over 85s. Each heat is also a final with medals at stake. World Masters is now a regular fixture for DARC. This year they took place on the World Rowing course at Lake Bagsvaerd, Copenhagen. The club concentrated on entries in the 55-70 year old bracket. In the absence of Gill Prescott due to family commitments this year, the sole female club representative was Sarah Rutter. 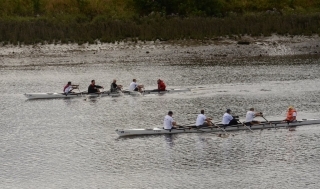 The Men’s Masters squad entered a variety of small boats, some more practised than others. This was apparent on the first day with a disappointing finish for the out-of-practice E2x of John Watkinson & club captain, Paul Rutter. Sarah Rutter, meanwhile, was doubling with Margit Rezacova from York City RC and they achieved a better result in WC2x. Conditions were difficult as the day progressed. As the wind picked up, the waves grew higher. The G4+ were a little disappointed with 4th place with Elvet Waterside proving difficult to handle in the rough conditions of a howling tail wind despite producing a fast time of 3m 42s. This was cox Elise Sanderson’s first international race & was quite a baptism of fire. Elise showed nerves of steel, handling the difficulties with style & aplomb. Friday started with a very nice row by the E4+ stroked by John Appleby. This four have been together through the summer & their preparation paid off. They finished 2nd to Moscow Dynamo who were the main opposition in most of our races. 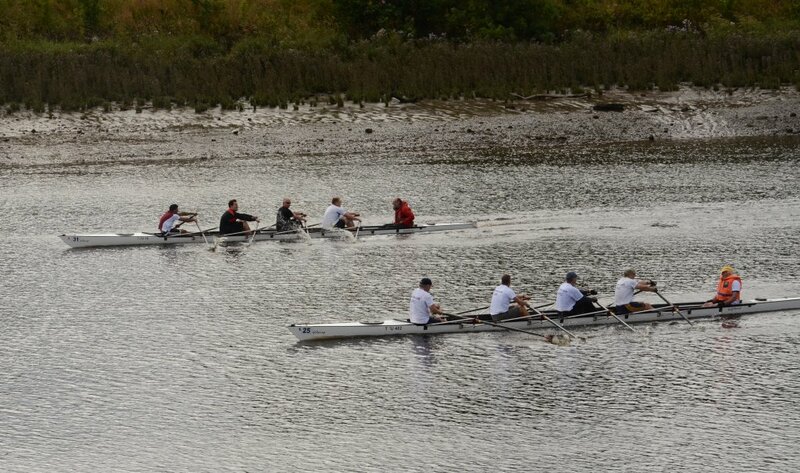 Eights are what the Men’s Masters squad is all about & it was now the turn of the F8. In order to make the most of our F status we used 2 substitutes. From Upper Thames Rowing Club we had Clive Cooper & from Poole in Dorset, former Whitby Friendship rower Ray Wilson, in place of 2 of our older G oarsmen at bow pair. We had a lane in the middle of the course with Russians in lane four on our left & a good German crew from Bremen in lane 2 on our right. The Russian Moscow Dynamo four who we had come across so often had teamed up with a St Petersburg four to create our biggest threat. From the first stroke we shot ahead of the field. It was going so well that cox Elise Sanderson extended our start sequence so that by the 250 metre mark we were already a good 3/4 length ahead…at which point we became aware that the race was being stopped. Over in lane 8 the Japanese had gone out of lane & clashed with the Danes in lane 7! The race was to be restarted. The Russians & Germans either side of us now knew what to expect from our start. They both went off much harder in order to try & stay in the race. Again we were significantly ahead by 250m. The crews on either side continued to keep a high tempo but could not stop us steadily pulling away. By the 500m mark we had pulled to a clear length lead & the opposition were effectively blown. We cruised home to a comfortable victory. A Gold for the club & in particular, a first international win for cox Elise Sanderson. John Appleby then had to climb into his single to compete in G1x. This was a race too much after the excitement of the 8 even though John finished in a respectable 4th place and that after having to use spare sculls when his new sculls were stolen. Saturday started with another largely unpracticed F4+. They finished in 5th place. Paul Rutter then had his E1x race. Paul started slowly & was last in the field early on. However he picked up speed to work his way through the field for a 3rd place finish. The G8 with Derek Gordon restored at bow & John Lund back in at 2 found themselves next to the Russian composite once again. A rather epic battle with them ensued with us taking a small lead early on, only to lose the lead by 750m. An early push for the finish took us past them but not enough to catch the American International crew of Occoquan, so we had to settle for the silver medal position. The final entry of the day was the F4x crew of Watkinson, Walker, Judson & Rutter. This is something of a development quad which has never before raced side by side. Settling for a highly respectable 4th place finish, we misinterpreted the finish pips & stopped rowing 2 strokes before the finish thereby losing 4th place by 0.2 second, a very frustrating way to lose a place in a race. Sunday is mixed racing day. This is usually scratch crews. The Rutters combined and finished 5th in quite a compact field. John Appleby was drafted in by Scots from Loch Lomond & Clydesdale to form a very accomplished quad which went on to win impressively. Derek Gordon was also drafted into a MxdH8 (average age 70+) which was truly international consisting of 2 Swiss, 2 Germans, a Dane, one french, one american & Derek the one Briton. They overcame a similar international H crew to take the win & the medals. The Winning F8+ crew is pictured top. From the left: Paul Stanley, David Walker, Martin Judson, Elise Sanderson, Paul Rutter, Clive Cooper, John Appleby, John Watkinson, Ray Wilson. Footage of their victory can also be found on YouTube. This entry was posted in Racing News, Uncategorized on September 21, 2016 by Colin Lawson. 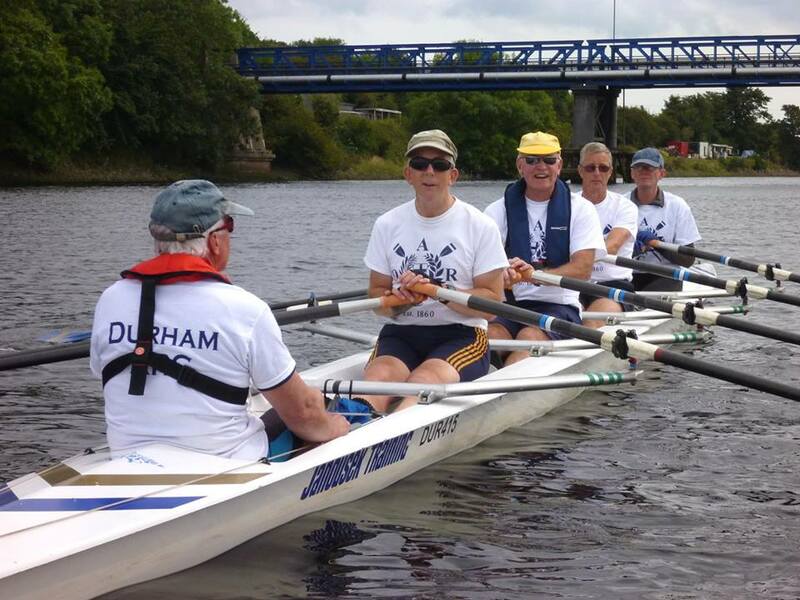 After the cancellation of the Talkin Tarn round of the Explore Series in August because of a forecast of strong winds the penultimate of the 8 rounds went ahead at the sumptuously refurbished Tyne Amateur Rowing Club on Sunday September 4th. A late start saw crews waiting for the tide to come in and the sun to come out before racing got underway at 1.30pm. It turned out to be a very successful day for Durham ARC teams, with DARC Green (Linda Forwood, Aisling Dutton, Julie Kitson and Paddy Deans) winning all 4 of their races to move into an unassailable lead in the Women’s league with one round remaining. They hold a lead of 6 and a half points over second placed Wear Here, also from Durham ARC, who were unable to take part on this occasion. Wear Past It (Colin Lawson, Vaughan Gordon, Chris Merchant, Dave Green and Steve Auster) put in a season’s best performance, winning their 4 races and remaining in 2nd place in the Open league 2 points behind Fog on the Tyne from the host club who were also unbeaten on the day, setting up an exciting prospect for the grand finale at Durham ARC on October 2nd. See the league table for the points breakdown from each round. Thanks to Caroline Scholl, Steve Auster and Dave Green for between them coxing the three DARC crews and to all at Tyne ARC for organisation and hospitality. Following Sunday’s sculling event the final round will be a sweep-oared event over a 300 metre course starting at 12 noon. Presentation of trophies to the league winners will be after the conclusion of the day’s racing around 4pm with a BBQ to follow. All club members and supporters are welcome to attend. The Explore Series is predominantly for novice, recreational, retired and returning rowers. It is the brainchild of James Andrews of British Rowing and takes place using stable coxed quads and fours. The first series took place in 2012. Originally known as the Sunday League it has developed as a result of pioneering work in the Northern region and is now recognised by all regions, with equivalent leagues in place nationwide. See the history page for more about events from previous years. This entry was posted in Racing News on September 7, 2016 by Colin Lawson. 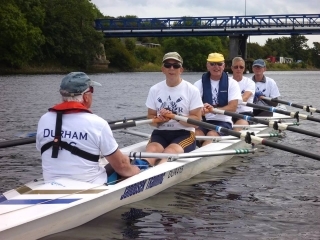 Durham ARC entered 3 crews for the 25km Great Tyne Row on Saturday August 27th, a popular annual challenge for stable and coastal boats, launching from Tyne United Rowing Club at Newburn and finishing beyond the ferry terminal at North Shields with crews continuing onwards to land on Tynemouth beach at Prior’s Haven. Twenty-six boats entered this year, down on last year’s 40. DARC crews included a women’s 4+ (DARC Blues Sisters) consisting of Ray Dominy, Steph Snowball, Vicky Jackson and Debbie Connolly coxed by Shona Miller, a mixed quad (Rose among thorns) comprising Paul Rutter, Sarah Rutter, Gabrielle Moore, Alison Shepherd and Kalpana Ganatra, and an open quad (Wear Still Here) including Colin Lawson, Dave Green, Stephen Auster, Chris Merchant and Vaughan Gordon. The latter 2 exchanged coxes mid-stream to share the duties. The row is typified by challenging conditions for crossing Tynemouth harbour but this year departed from the norm with sunshine and relatively calm conditions at the mouth of the Tyne but with a headwind causing much rougher water along the route. All participants relished the challenge and enjoyed the burger and Northumbrian Blonde provided on the beach by the co-hosts Tynemouth Rowing Club after the finish. DARC Blues Sisters won the pennant for Best Dressed Crew, finishing in a time of 2hrs 11mns. Rose Among Thorns came 5th in 2hrs 03min and Wear Still Here finished in 2hrs 09min. This entry was posted in Event News on September 1, 2016 by Colin Lawson. The World Rowing Championships took place on the recently opened 6 lane Willem-Alexander Baan course in Rotterdam between August 21st and 28th, with Hope Cessford of Durham ARC and Lauren Irwin of Chester-le-Street ARC selected for Great Britain in the Junior Women’s Pair (for athletes under 19), the only representatives from the Northern region in the GB squad. The Championships combines Senior, under-23 and Junior championships into a huge 8-day extravaganza, the most important World Rowing event of the season, under the banner of the world governing body FISA. The GB pair’s first race over the 2000 metre course was on Wednesday where they were drawn in a difficult heat with the winning USA pair setting a World Championship best time of 7min 16 sec. With only the winners qualifying automatically for the A final, Hope and Lauren finished in 5th place in 7.42, qualifying for the repechage the following day. A fourth place finish behind Denmark on Thursday put the GB pair into Sunday’s B final. The B final was a close race for the leading places between Romania, Lithuania and Great Britain, but despite a strong challenge in the 3rd quarter the GB pair finished in 3rd place, half a length behind Lithuania in 7min 31sec. This entry was posted in Racing News, Uncategorized on September 1, 2016 by Colin Lawson.